so please feel free to browse around and take a look at what was Dragon Data and their products. Spammers killed my email!. Spammer have kindly taken to using dragondata.co.uk as a spoof email reply address on spam email. This has meant my email on my domain has become almost useless, it means dragondata.co.uk being blacklisted by anti-spam bots. Please use a Dragon related subject mater other it might get deleted. All 4 diagrams have been updated with 2 additional quality Dragon 64 circuit diagrams added and available for download (Set 4). 2 high quality Dragon 64 circuit diagrams cleaned, restored and available for download (Set 4). Thanks to Tony Jewell for doing the proofread. 5 TANO items, inc. leaflet, Press Release and Dealer Price Lists have been added into the adverts section. 7 FarmFax leaflets and brochures have been added into the adverts section. On 16th June 2018 at the Centre for Computing History in Cambridge, the stars aligned in the constellation of Draco and every known Dragon variant made by Dragon Data and Eurohard came together for the first time in the same place. Dragon Data posters has been updated and now includes 12 300dpi scans of original posters, ready to download and print! Its that's time of year for a Dragon meet at the Centre for Computing History museum in Cambridge, on the 16th June 2018. There will loads of stuff on display and to play with, from original rarities through to new developments like the Dragon MMC card interface. If all the planets align there be should be member of the Dragon Data dev. team and for the first time in one place, all the known production and prototype machine variants, from the Dragon Pippin (D32 prototype) through the Eurohard MSX prototype. The Dragon Data Archive makes a pilgrimage to the former Dragon Data factory at Kenfig, Port Talbot. Remastered the pcitures outside the Kenfig factory and Kevin Stephens outside the factory. Again thanks Gareth Tuttiett for the original photos. The Dragon MMC has finally been released! Found some unprocessed items from my visits to Duncan Smeed years ago. First of those items to get processed and restored is a document describing the changes required to OS9 for the Dragon 128 (Beta) prototype. Simon of the archive.worldofdragon.org for letting me piggyback off his site all these years. The first Dragon (and 6809) meet in over 20 years occured at The Centre for Computing History, see the pics here. The Dragon Data archive is thrust into the real world and help show the world the way of the Dragon at the Vintage Computer Festival @ Bletchley Park, pics and more info here. John has been very busy scanning in the circuit diagrams of the Beta prototype. The keyboard and the first sheet has been done. Here they are. The first public pictures a complete Beta Prototype. The Beta gets its first run out on the 'highway', allow the first real test of the graphics modes, disk drive etc... and all appears well. All enabled by some great work on the keyboard interface. Lack of updates.... sorry about this but the Dragon Beta is sucking all my spare time. The machine is now rebuilt, sadly it is still refusing boot. Only the plus side it is actually running some code and setting up the PIA's but it gets no further. There appears to a fault in the memory mapping/addressing, so some reverse engineering is in progress to understand the process. Oh, nearly forgot actualy forgot to mention that after staring at bare Alpha I have made a replica top cover, pics here. 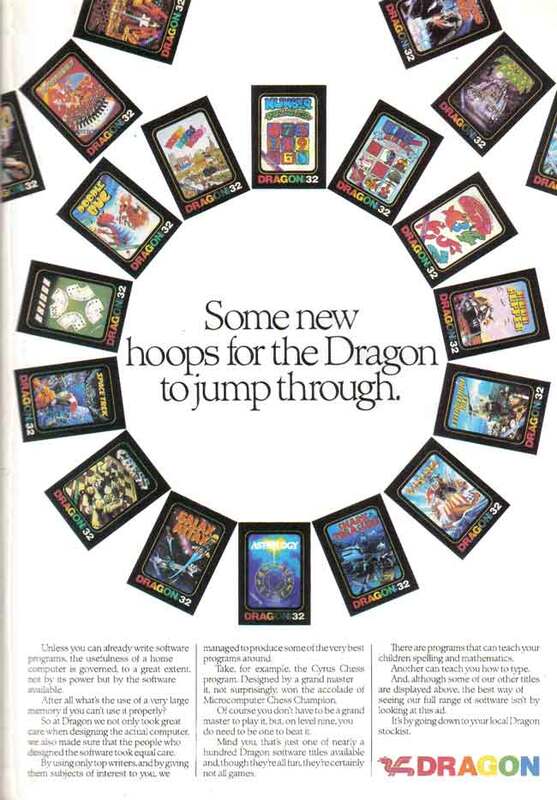 Just to keep you happy ;o) a new Dragon Data advert. And again on going thanks to Phill, Simon and Rob for their help.
" ..... I extend my sincere sympathies to his relatives and friends (the world over)." "He was an extremely busy man, but never to my knowledge neglected, or failed to answer, correspondence." "Paul was one of those people who actually got his hands dirty and did things rather than sitting there and complaining that 'someone should do something'. The world would be a better place for more of his type of people. " After XP SP2 the menus have been blocked by default in explorer, have now updated the menu to allow all the main titles to be clicked. This will also help other non explorer browesers. I'll do best to get CGE UK pic's up within a couple of weeks. The Dragon Data Archive is teaming up with the Dragon Archive at the Classic Gaming Expo in Croydon, London on Saturday August 13th 2005. We'll have Dragon 32 & 64's up and running for you to play on, plus the first public showing the Dragon Alpha + More, so come on down for a chat and enjoy loads of other gaming. The Beta machine is in a serious state of resoration at the moment, i.e. not a single component on the board. Now begins the even longer process of cleaning the thousands solder pads ready for it's re-build. Alpha DragonDOS demo disk, with what looks like a couple of unpublished games. Beta OS9 Level Two Source code. Update to allow single density on track 0 (Beta format disks)., D64 and Alpha versions. Update to Alpha version for improved interrupt handling. Beta emulation - Very long term project but the boot screen works! Creating disk images of the Alpha/Beta s/w. When the Alpha MESS update has gone through and the Disk Images tested, Simon will (hopefully) be making the disk images available on his site. Nitros OS9 ported the Dragon 64. Nitros OS9 ported the Dragon Alpha. Dragon DOS ported to a bootable Alpha disk. Super DOS ported to a bootable Alpha disk. First picture of the Dragon Beta boot screen! After NitrOS9 and DOS became available it rapidly became apparent that the Dragon Alpha had intermittent problems with the floppy drives. As Phill is currently the source of any software for the Alpha it required another visit to his domain to discover where the problems lay (Floppy drives, Alpha, software, floppy creating etc. etc.) After a good poke about and a re-cal of the floppy controller and it's back in business - a massive improvement in reliability. Also added the Dragon DOS cart circuit diagram. Updates for 2002, 2003 and 2004. Updates for 2001 and earlier. 1. To preserve the history and products of Dragon Data Ltd UK. 2. To make the archives information and pictures freely available via. this website. 3. Items/Information/Pictures etc. donated to the archive will not be used for personal gain (sold etc.) or be exploited in any way. Also many thanks to the other Dragon/TRS-80 recourses on the web, who's information has been most invaluable in compiling this site. Disclaimer: (1) Please not that this site is in no way owned/affiliated to Dragon Data Ltd. or Eurohard. (2) All information is to best of my knowledge and I can not be held responsible for any loss resulting from information contained within.